People lie about a lot of things: age, weight ... number of Botox injections. Sometimes lies can be harmless (who needs to know that your natural hair color isn't really blond? ); other times they can get you into big trouble. When it comes to employment, bending the truth on your resume might seem worth it in today's competitive workforce, but it will likely get your resume sent to the reject pile. According to a CareerBuilder survey, 58 percent of hiring managers say they've caught a lie on a resume; 33 percent of these employers have seen an increase in resume embellishments post-recession.While half of employers (51 percent) would automatically dismiss a candidate if they caught a lie on his or her resume, 40 percent say that it would depend on what the candidate lied about. 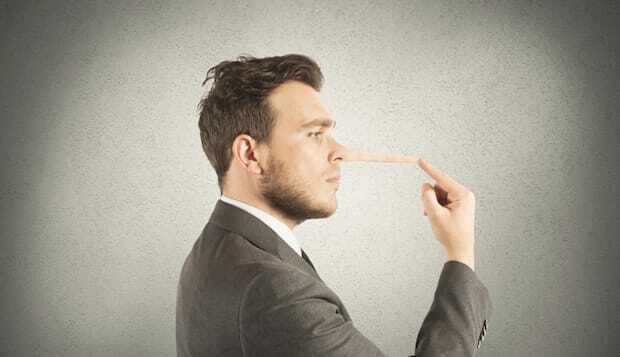 Seven percent of employers would even be willing to overlook a lie if they clicked with the candidate. "Trust is very important in professional relationships, and by lying on your resume, you breach that trust from the very outset," says Rosemary Haefner, vice president of human resources at CareerBuilder. "If you want to enhance your resume, it's better to focus on playing up tangible examples from your actual experience. Your resume doesn't necessarily have to be the perfect fit for an organization, but it needs to be relevant and accurate." It's one thing to spin your experience to make it more relevant to the position you're pursuing. It's another thing to claim you have more years of experience than is possible at your age. And that's actually happened: One employer surveyed says an applicant claimed to have 25 years of experience at age 32. Applicant listed three jobs over the past several years. Upon contacting the employers, the interviewer learned that the applicant had worked at one for two days, another for one day and not at all for the third. Applicant applied to a position with a company that had just terminated him. He listed the company under previous employment and indicated on his resume that he had quit.